First, the fine print. When talking about commercial condensing boilers, caveat emptor – Latin for “buyer beware.” A phrase usually associated with real estate transactions is highly applicable to the purchase and application of “high efficiency” or condensing boilers. There’s no definition of the word “high” when it comes to “high efficiency” boilers. Usually, these are boilers whose construction allows them to operate with lower water temperatures than traditional boilers. This allows them to, in theory, extract more of the useful energy from the fuel source (usually natural gas or propane) than the traditional boiler would. Notice I said “in theory.” I’ll get to that shortly. I’m going to be brief here because there are a lot of readily available resources that explain condensing boiler technology. Basically, condensing boilers are designed to take advantage of the latent energy available in the exhaust flue gasses. By allowing the temperature of the return water to go below roughly 130° F this causes moisture to condense out of the flue gas. That moisture is vapor before it condenses and by turning a vapor into a liquid, useful energy (heat) is given up in the process. In this case, it’s given up to the hot water you’re trying to heat your home or building with. It’s the harvesting of this latent energy that increases the efficiency percentage of a boiler beyond the low 80’s. This isn’t an all or nothing deal, however. The vapor in the flue gas only starts to condense at about 130° F return water temperature. You get very little increase in efficiency beyond non-condensing operation at this temperature. Slightly above a 70° F return water temperature is when you hit the 98%-99% efficiency numbers you often see advertised. The increase in efficiency is roughly linear with a corresponding drop in return water temperature. Therein lies the key to getting the most out of your condensing boiler. For the sake of this discussion, I’ll assume that these are stand-alone heating systems that are not tied into a building management system (BMS). Many of the same principles, though, apply to BMS-tied boilers as well. Boiler manufacturers provide factory default hot water supply temperature (HWST) reset control settings that rely on an outdoor air temperature (OAT) sensor being present. The reset control changes the HWST set point the boiler maintains as a function of OAT; as OAT goes up, HWST goes down. The idea is to try to achieve condensing operation at some point during the heating season and it’s possible because at higher outdoor air temperatures, the amount of heat needed from your heating system goes down. Of particular note is that an outdoor air temperature sensor has to be connected to the boiler to reset the hot water temperature. If no sensor is present, all boiler manufacturers have a HWST factory default setpoint of between 176° F and 194° F (roughly). Why? Hot water temperatures within this range will generally satisfy a large majority of heating systems’ demands and if nobody installs and connects the OAT sensor, the boiler manufacturer wants to be sure their product delivers heat. Without the OAT sensor, the boiler will never condense and its efficiency will average between 80% and 85% in most cases, no better than a good non-condensing boiler. The extra capital investment spent on a condensing boiler was just lost. OK, so let’s assume an OAT sensor is present. 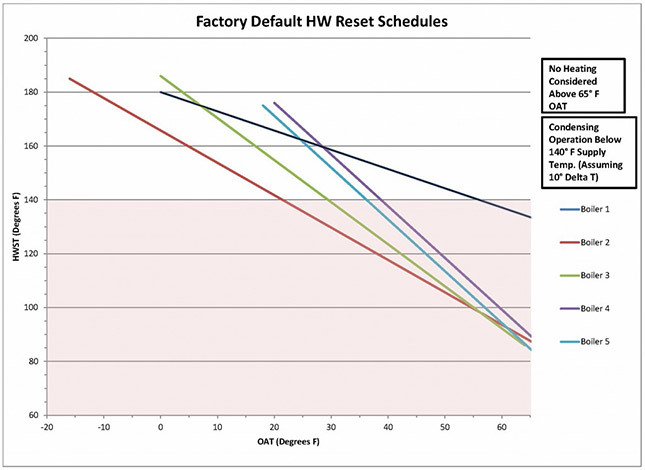 Figure 1 is a chart showing the factory default, out-of-the-box, hot water supply temperature (HWST) reset schedule as a function of OAT. Figure 1 represents five different, small-scale condensing boilers (up to about 2.0 MMBTUH) from varying, well known manufacturers. Let’s take Boiler #1 as our example. This boiler starts to condense when the OAT is above about 56° F. Now, for example, between 55 and 65 OAT in Burlington, Vermont (a cold climate, ASHRAE 6 A / B), that’s still about 2290 hours or 33% of the hours the boiler will operate. Not bad, but it leaves 67% of the time when the boiler is not condensing. The other manufacturers have more aggressive curves to varying degrees, but there is still an opportunity with most to take better advantage of the more efficient operation due to condensing. Of note here is that Boilers 2 and 3 already have quite good curves out of the box. Before making any tweaks, be sure to know your starting point. Figure 1. Factory default curves with OAT sensor present shows significant opportunity for optimization with some and very good “out of the box” performance for others. It’s important to start with the end, and end with the beginning; in this case, start with the equipment that delivers heat to the space, like a radiator or finned tube radiation aka the “terminal device.” Typically, these are designed to deliver the peak heating required to the space using somewhere around 18o° F water. That peak is only for roughly 88 hours (1%) of the entire year when based on ASHRAE design data and, frankly, that peak is almost always designed to be higher than truly necessary; the system is oversized. Reducing that HWST by just 20 degrees changes the reset curves and lowers the OAT at which the boiler begins to condense. Using Boiler #1 as an example, this makes the condensing OAT about 46° F which increases the number of hours to about 3512 or 50% of the time. Figure 2 Lowering the maximum HWST results in 17% more hours of condensing operation in this example. Existing systems are typically oversized, allowing for the lower HWST and new systems can be designed accordingly. In new construction the terminal heating device can easily be selected to satisfy the design condition with 160 vs. 180 degree water with little or no impact on physical size and minimal impact on first cost. In fact, the simple payback for fuel savings vs. additional terminal device cost will very likely be less than four years and in most cases be between one and two. In existing construction, it’s likely the heating system is oversized enough that the same approach can be taken and the payback is immediate because there’s no additional capital cost. With the terminal units designed to use a maximum of 160° F water, you’ve just increased the hours of condensing operation. 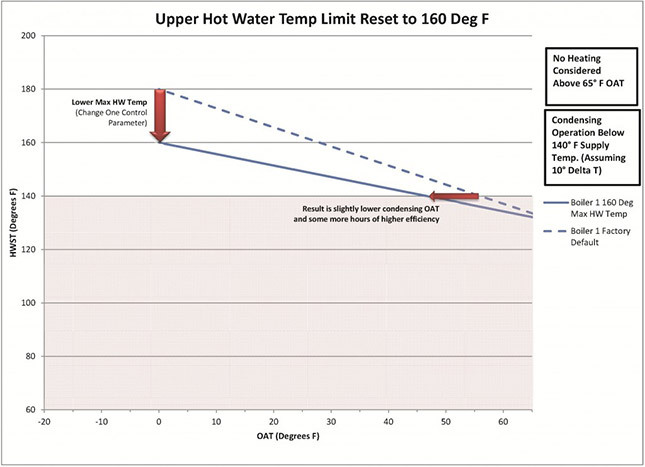 By designing for lower maximum hot water temperatures, engineers and designers can take more advantage of condensing operation and the commensurate increase in boiler efficiency. Once the heat delivery components are taken care of, making the changes at the boiler controller is where the rubber meets the road. Changing the operating parameters will be in the user’s manual and will be more or less daunting depending on the make and model of the boiler, but in most cases will be fairly straightforward. The simplest approach involves changing one parameter on your boiler controller - the maximum HWST. This changes the shape (the slope, really) of the reset curve, lowering the OAT at which condensing begins to happen. This is what’s represented in Figure 2. But hang on – we can do even better. Rather than change the reset curve slope, let’s shift it to the left altogether. The heat loss from a building varies linearly with the OAT and, as luck (or physics) would have it, the BTU output of typical finned tube or flat panel radiation (the heat delivery devices) varies linearly (more or less) with the water temperature that’s delivered to them. This relationship allows you shift the entire reset curve to the left rather than just lower the maximum water temperature. In the case of Boiler #1, this approach puts you in condensing mode 80% of the time! 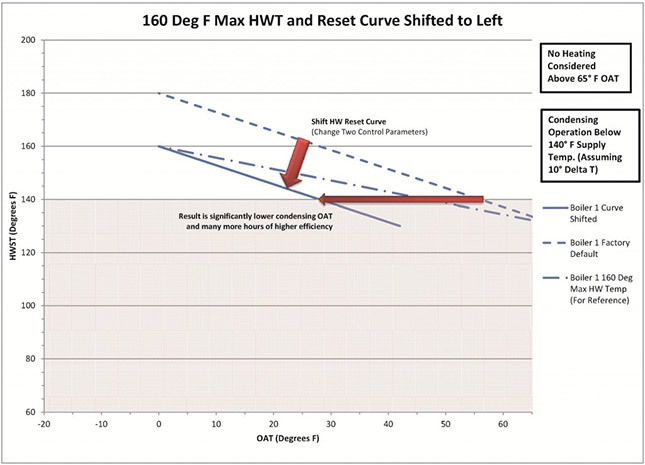 Figure 3 shows what happens when you lower the maximum HWS temperature to 160 AND shift the curve rather than change the slope. Figure 3 Shifting the actual curve results in 47% more hours of condensing operation. This approach involves changing two parameters on your boiler controller - the maximum HWST and the maximum OAT. To get this right, you can go back to high school algebra to figure out the new maximum OAT corresponding to the lowest HWST or you can graph the numbers and use a good-ol’ ruler to get very close. I used Boiler #1 as my example because it had the out-of-the box settings that offered the most potential savings. Of note, though, is that this boiler has three pre-set reset curves, the most aggressive of which has a maximum HWST of only 120° F and puts the boiler in condensing mode 100% of the time. If you take the time to read the manual, you might find that you can do away with that pesky math or that clunky ruler by simply using an already built in reset curve. Just make sure the heat delivery devices are sized appropriately. In order for commercial condensing boilers to realize their potential for increased efficiency, they’ve got to be allowed to condense. You do that by lowering the hot water supply temperature set point which, in turn, lowers the return temperature as well. Many boiler manufacturers offer more than one pre-set curve while others allow manipulation of the set points themselves. In either case, with a little planning and some understanding of how the boiler controls actually work, you can increase the seasonal efficiency of your boiler with little or no added first cost. Who can say no to that offer?